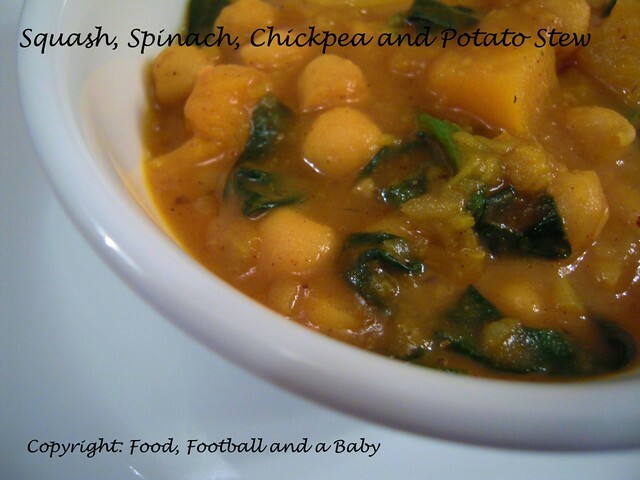 One of my most memorable dishes is a very simple chickpea and spinach stew that a friend made for us back in Terrace. Our friend, lets call him DS, is always super busy, being a very well respected and loved doctor in the community. As our families are quite close, we get invited over to dinner to his whenever we go to Terrace to visit. DS owns a slow cooker, and he almost always makes a dish in it that is perfectly cooked, and beautifully spiced. I remembered that particular dish when Jacqueline over at Tinned Tomatoes challenged us to come up with a dish for the slow cooker. Now, unfortunately, I don't have a slow cooker (now added to the ever growing list of appliances that I really really need), but as Jacqueline says, the dish doesn't really have to be cooked in a slow cooker, just be suitable for it. I looked all over for that particular recipe of DS's, but had no luck. I called MIL who figured that DS must have got it from one of his numerous slow cooker cookery books, but of course, I couldn't particularly ask him to remember a dish he'd served me over five years ago :-) So I decided I would try and recreate the taste myself. I had some help from a Canadian Living recipe, but I adapted it quite heavily, in addition to making my own Madras Curry Powder. In the end, I was thrilled to discover that the stew tasted very much like that long remembered taste of DS's stew. It was mild enough that Aditi (who is usually quite wary of spicy food... yes, this is my daughter!) scoffed a whole lot, and asked for seconds. But it was flavourful enough for me and Kay, who is usually quite particular about his stews. The addition of all the lovely veggies made it very nutritious, and if you skip the coconut milk, its beautifully healthy too. What more can you ask of dinner, pray tell? 1. In a big pot, heat the oil on a medium heat, and add the diced onion. Fry for 3 - 4 minutes, until the raw smell disappears, then add the ginger and garlic. Sauté for an additional minute. 2. Add the curry powder and the tomato paste, and fry together for 5 - 7 minutes, adding a teeny dash of water if the mixture is too dry. 3. Add the cubed squash, potatoes to the onion mixture. Stir, then add the hot vegetable stock. Simmer for 5 -6 minutes, then add the drained chickpeas. Stir everything together, and leave to simmer on a low heat for 10 - 15 minutes, or until the potatoes and squash are tender. 5. Stir in the spinach, and cook for a few minutes, until the spinach wilts. 6. Swirl in the coconut milk just before serving. 7. 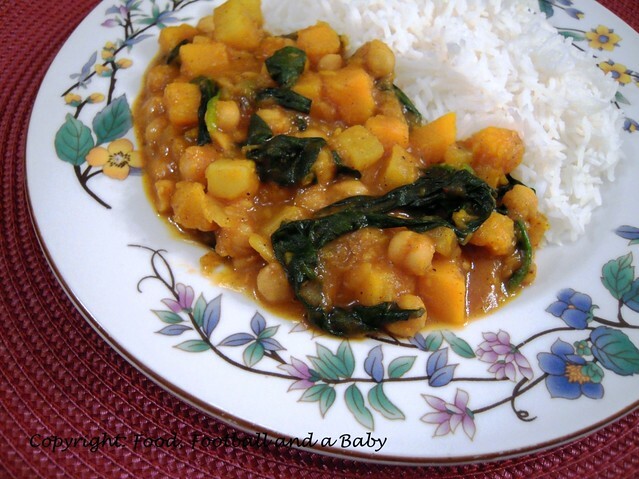 Serve with rice or any Indian bread. Follow steps 1 and 2 in a heavy pan instead of a pot. 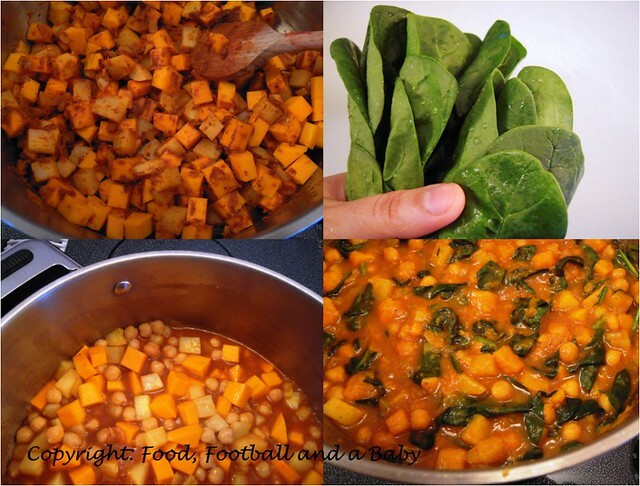 Place the cubed squash, potatoes and chickpeas in the slow cooker. Add the onion-tomato mixture and the stock. Stir together, then cook on its lowest setting for roughly 4 hours. 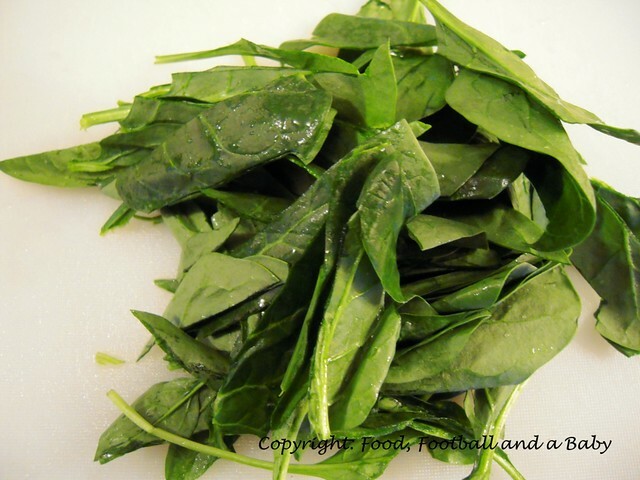 Open the cooker and stir in the spinach. Cook an additional 5 minutes. Season to taste. Swirl in the coconut milk just before serving. Hi Michelle, I am from California and stumbled onto your blog. Just wanted to say hi and what a great looking berry pie. My favorite. You have a great blog. And with a great name. All the essentials of life. I also write a blog on food but with a relationship twist. Please stop by and visit. I always welcome new followers if you like the writing. Thanks! I made this today in a slow cooker and, yes, I did use your recipe to make the Madras curry powder too. We enjoyed it loads. The small amount of leftovers has now been wizzed up to make a soup for lunch tomorrow. Thanks a lot for this. It could become family favourite like your navratan korma. @Phil, thanks so much. Its such a nice feeling when someone makes your recipes, and even better if they like them :-) The navratan korma is a firm favourite of ours too, so am really glad you like it. The fresh curry powder does make tons of difference to the dish for sure. I am so glad you visited my blog, yours has been such an inspiration to me.